Japan’s Shinkansen high-speed rail system is the greatest network of trains ever invented by humans. The Germans are competent engineers, but chose to incrementally upgrade rather than replace their national rail network. The French? They’ve won a few races (and in fairness, it’s hard to beat a train ride across the French countryside). The Chinese? Japanese technology — enough said. And the Americans? Let’s not go there. Shinkansen is the model: Its Tokaido Line between Tokyo and Osaka has saved travelers so much time over its 50 years, and made so much money, that operator JR Central is now investing $52 billion in the first (Tokyo-to-Nagoya) phase of a next-generation maglev upgrade of the corridor that will have an average speed of 265 miles per hour. Extensions of the existing “conventional” 150-200 mph Shinkansen network, meanwhile, are plowing ahead, with one line branching toward Nagasaki, another looping from Tokyo and Nagano along the Sea of Japan toward Kyoto and Osaka, and another continuing north as far as Sapporo. Shinkansen’s only limitation? A lack of English-language information. Shinkansen can be difficult to decipher for non-Japanese speakers. This is partly because foreign-language information is limited, but also because ever since the breakup of Japanese National Railways in the ‘80s, Shinkansen has been operated by several different private companies. 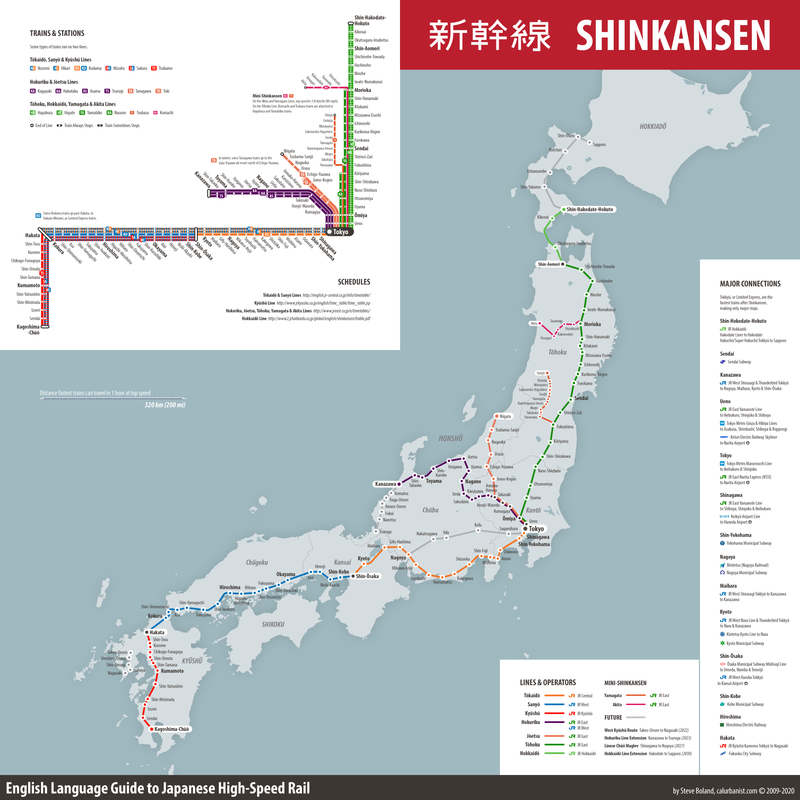 Shinkansen lines are also not the same thing as Shinkansen “trains,” or services: There are several trains on each line (e.g., local, limited and express), and some run on two lines. Nor do the same trains always make the same stops. This “map,” obviously, is two maps: one a typical geographical intercity rail map showing where trains go, and the other a diagram providing more specific information on how to get there. The font is Myriad Condensed.